Assura Medical – Case studies123. Private provider The Practice has taken over Chilvers and McCrea Ltd, taking its growing business to 50 practices and GP-led health centres. After completing the deal, the company predicted that smaller organisations would no longer be able to survive under the Government’s white paper plans. 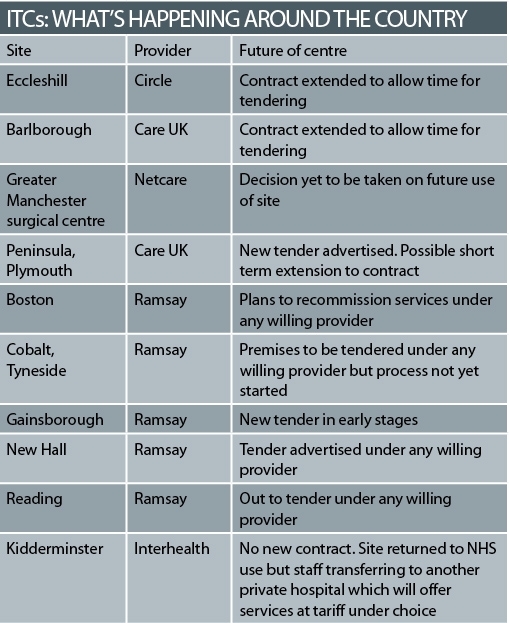 Private firms are bidding to take advantage of the Government’s plans by offering national-scale operations as providers and also offering commissioning support, but the move suggests there will be a survival of the biggest. Dr Sarah Chilvers and Dr Rory McCrea, founders of Chilvers and McCrea Ltd, said selling the business to The Practice would give it ‘longer term greater financial security’ benefiting ‘patients, stakeholders and surgery staff alike’. Pulse – Map of Darzi contract renegotiations. Pulse – Half of Darzi centres under review. NHS Kingston has announced the preferred location of a new GP led health centre which will open later this year in Gosbury Hill, Hook. The centre – the first of its kind in Kingston – will offer a range of walk-in services and appointments to both registered and non-registered patients. The GP led health centre will operate in addition to Grays Medical Practice and Orchard Practice, which are already based on the site. David Smith, chief executive for NHS Kingston, said: “It’s good news that a venue for the GP led centre has been found which will provide additional health services for local residents including walk-in services and longer opening hours. At the end of last year, following an open tendering process, the Grays Medical Practice was appointed as the preferred bidder to buy the Gosbury Hill site and to develop new premises for both its own practice and the neighbouring Orchard Practice which occupies the same building. The Grays Medical Practice will be leading the development of the premises which will include the new GP led centre. Malling Health will be contracted by NHS Kingston to run the GP led health centre and provide a high standard of service for local people. Dr John Gray, from Grays Medical Practice, said: “We’re delighted to have the opportunity to take the Gosbury Hill site into the new decade for the benefit of all local residents. We’ll be using our expertise on local health needs to lead the development of the new premises. Plans are being developed for state-of-the-art premises that will be lighter, more spacious and enable the practices to benefit from the latest technological developments. A planning application is expected within the first few months of this year. It is anticipated that walk-in services will be available at Gosbury Hill without impacting on current GP services. This will be achieved by some internal reorganisation of the building which is expected to be completed in April 2010. In the longer term, the site will also provide additional health services for the local community as part of NHS Kingston’s ongoing polysystems programme bringing more services closer to home. What is a GP Led Health Centre? In October 2007, Lord Darzi published the interim report of the NHS Next Stage Review (England only), which announced a number of immediate recommendations, including the establishment of 1 new GP-led health centre per PCT. The GP Led Health Centre will be a new service that will offer GP and Nurse Appointments. The centre will offer a full range of medical services to all registered and non registered patients offering pre-bookable appointments, walk-in services and other co-located services. A new GP practice is set to open in north Birmingham following a contract award by NHS Birmingham East and North. Operated by Assura Vertis LLP, the practice will be based at the Warren Farm Health Centre and will work with its local community to develop an increased range of health facilities relevant to the needs of the local population. The practice will offer increased choice to local patients as well as extended opening hours by opening until 8pm two evenings a week and on Saturday mornings. The contract was awarded as part of the Government’s national Equitable Access to Primary Medical Care (EAPMC) services programme which was designed to increase access to GPs in communities that have traditionally experienced greater levels of ill health and have access to a lower number of GPs than other areas. Under the scheme NHS Birmingham East and North has been allocated extra funding to commission new GP practices and a new GP-led health centre. Following a detailed tender process, work on a new practice for Kingstanding was given the green light when the GPs came in to sign contracts with the trust. Andrew McKeon, AJM Public Relations. It will be even easier for people in Southampton to access their GP with the opening of the new Adelaide GP Surgery next week (Tuesday 12 January 2010). Based at the brand new Adelaide Health Centre, which is also home to a range of NHS services, the surgery will offer extended opening hours of 8am to 8pm, seven days week, excluding bank holidays. With both male and female doctors, the Adelaide GP Surgery will provide the same care offered by a traditional GP practice including flu jabs, blood tests, health promotion services, whilst also being located in the same building as a number of important NHS services. Patients who register with the surgery will be able to see a doctor every day by appointment, and will have the added benefit of being able to walk-in to see an experienced nurse without an appointment between 8am and 8pm. Patients who wish to register with the Surgery, which is based at the Adelaide Health Centre on the Western Community Hospital site, should ring 0300 123 6066 or visit the Surgery from Tuesday 12 January. Media opportunity: Media are invited to attend the surgery on 12 January 2010 between 10am and 11am for interviews and photo opportunities. Please contact Andrea Musk on 023 8060 8935 to confirm attendance. Attached with this press release are images of the Adelaide Health Centre and the new GP surgery. More images are available on request. An official opening of the surgery will take place later in the year, for which a future media release will be circulated. For more information please contact Andrea Musk, Communications Manager, Southampton Community Healthcare on 023 8060 8935. Any provider able to deliver a service that meets required standards and is within a NHS tariff will be allowed to offer their services to patients, the Conservatives have announced in their draft health manifesto. The document says the Tories want to ‘open up the NHS to include new independent and voluntary sector providers. If they can deliver a service that patients want to a high standard and within the NHS tariff then they should be allowed to do so’. The policy appears to draw a line in the sand over the NHS market with Labour whose health secretary Andy Burnham last year said the NHS was the ‘preferred provider’. Published on Monday to kickstart the Tory election campaign, the document also makes clear GPs will be the commissioners of patients’ care and will hold patients’ budgets. The manifesto also pledges to cut NHS administration by a third by devolving decision making to patients. The NAPC said it ‘warmly welcomed’ the manifesto’s proposals, particularly the move to give GPs the power to hold patients’ budgets. ‘Such a proposal resonates strongly with this organisation’s own manifesto published last November’, commented Mike Ramsden, Chief Executive Officer of NAPC. ‘Similarly, NAPC is delighted that the Conservatives intend to devolve decision-making closer to patients, eliminating unnecessary layers of bureaucracy and transfer freed up resources to support frontline doctors and nurses’, he continued. ‘Such a move is extremely important, at a time when the funding of the NHS is so very seriously challenged’. Mersey View Surgery & GP Led Walk-in Service is a facility commissioned by NHS Liverpool Primary Care Trust. The centre, operated by Care UK, a leading independent provider of health and social care services, is located within Everton Road Health Centre, 45 Everton Road, Liverpool. The centre is open every day from 8am-8pm and offers a range of comprehensive services to registered patients and a walk-in service for the treatment of minor injuries and illnesses, without having to make an appointment. 45 Everton Road, L6 2EH. A NEW walk-in GP practice has opened in Hemlington, marking the completion of an £11m boost to primary care services on Teesside. NHS Tees approved plans to open six new GP surgeries and four GP-led health centres in August 2008 to help tackle some of the area’s more serious health problems. And staff are now celebrating as the last of the new facilities opened its doors. Chris Willis, chief executive of NHS Tees said: “We are delighted to see the last of these new practices open its doors. “These recent initiatives show our commitment to improve patients’ access to local health services in areas where they are most needed. Hemlington NHS Medical Centre is currently housed in temporary premises adjacent to the Viewley Centre and is open from 8am to 6.30pm, Monday to Friday. A permanent base for the centre is planned within the refurbished Viewley Centre which is expected to reopen in April. The £11m investment in primary care across the NHS Tees area has seen the opening of Stockton NHS Health Centre in High Newham Road, Eston Grange NHS Health Care Centre in Queen Street, South Bank and the Resolution Health Centre in Trinity Mews, North Ormesby. Hartlepool NHS Healthcare Centre in Victoria Road, Hartlepool has also opened as part of the investment. Each centre is open from 8am to 8pm, seven days a week, 365 days a year, and anyone can walk-in for treatment without an appointment even if they are not registered as a patient. The Eston facility will be relocated in 2010 to the new Low Grange Farm medical facility currently being constructed on Normanby Road, South Bank. New GP practices have also been opened in Skelton, Redcar, Hemlington, Park End in Middlesbrough, The Fens in Hartlepool and Hartfields Extra Care Village in Hartlepool. Services at the new Hemlington practice are being provided by Bondcare and prospective patients are asked to call 01642 514350 to register.